La Jolla Dental Care is pleased to offer sedation dentistry, providing patients the luxury of having fine cosmetic, implant, and restorative dentistry performed while being sedated to a level of complete relaxation. Afterwards, you will have little or no recollection of the procedures. Dr. Briscoe and his assistants have special training in sedation dentistry through DOCS — Dental Organization for Conscious Sedation. This means that you are in kind, gentle and expert hands when you select Oral Conscious Sedation. With sedation dentistry patients can be completely relaxed during treatment, with no pain, no gagging and no anxiety. Sedation dentistry has made it possible for thousands of Dr. Briscoe’s patients to overcome their fear of dental work and get much needed dental care. 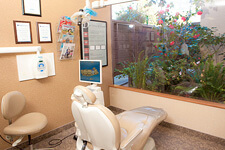 With oral conscious sedation we can complete multiple procedures at the same time, while you are relaxing comfortably. Here's how it works. You will be prescribed a pill (Halcion®) to take one hour prior to your scheduled dental visit. After you take the pill, you will need to have someone drive you to your dental appointment. Be sure to arrange for someone to drive you home as well once your appointment is over! When you arrive at our office in La Jolla, just north of downtown San Diego, you will be awake, but feeling very drowsy and relaxed. We will take you immediately to the dental treatment area and seat you in the dental chair, placing you on a monitor so that we can carefully watch all of your vital signs during your appointment. If you would like to listen to soothing, relaxing music, a CD player with headset is available. Tinted glasses will be used to keep the bright light out of your eyes, and for protection. We will also provide you with a blanket and pillow for added comfort. The oral sedative will relax you, but it is not a pain reliever. Local anesthetics will be used during your procedures to prevent pain. Because you are so relaxed, and because of the use of painless injection techniques, you will probably not remember when your mouth was actually being "numbed". 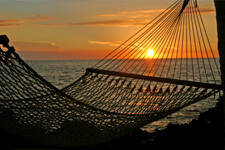 When you are fully awake, you will feel comfortable, relaxed and free from stress. You will probably remember very little about your wonderful, relaxing, sedation dentistry experience — but you will notice the changes to your smile! By ensuring our patients are as comfortable as possible, Dr. Briscoe is regularly praised as providing the best sedation dentistry San Diego has available. Please don't operate a motor vehicle for 24 hours after receiving Oral Conscious Sedation. There are four categories of patients for whom sedation dentistry in the San Diego office has been most effective. It is estimated that over 90 million people in the US fear going to the dentist. These people suffer from varying degrees of discomfort when considering a dental visit ranging from mild anxiety to terror. Dr. Briscoe understands this fear and works to reassure these patients that sedation dentistry has made it possible for millions of people to overcome resistance and finally get the care they need. Often need is what motivates people to seek a solution to their anxiety. A missing or infected tooth that is causing pain finally prompts a visit to the dentist. Dr. Briscoe is often referred by other patients who were formerly afraid to visit the dentist and have had the experience of working with a top sedation dentist in La Jolla. Dr. Briscoe does not believe in chastising his patients for their lack of necessary dental work, realizing that this fear is something very hard to overcome in many people. Instead he believes that by accomplishing as much as possible in each visit his patients achieve dental health, confidence in visiting the dentist and a renewed ability to schedule regular visits. Often a successful career in a highly competitive field as in the sales industry requires long hours and missed weekends. These people have had very little personal time while building their career and finally find themselves with multiple dental issues and very little time. Often they require dental maintenance and wish to combine this with needed cosmetic dentistry. Sedation dentistry in the La Jolla office is the solution for these busy people. Depending on the work to be done, in a matter of a few visits, much can be accomplished. Patients can comfortably undergo dental work for six to eight hours leaving the office with a healthy mouth and a new smile. After that the only challenge is to schedule regular visits to maintain their improved dental health. Many people suffer from highly sensitive gag reflexes. This makes it impossible for them to be reclined in the dental chair and dental work has to be done with the patient almost vertical. Access to the back of the mouth is restricted and these patients often avoid dental work completely. Using oral conscious sedation, the gag reflex is eliminated in most patients and work can be done quickly and efficiently. Patients suffering from this reaction are relieved to find a solution by seeing one of the top sedation dentists in San Diego. For whatever reason, patients may defer dental work for years. Whether it is fear, time schedules, unawareness of problems or a combination, there comes a time when the need to see a dentist is acute. In patients who have not seen a dentist for years the list can be long. 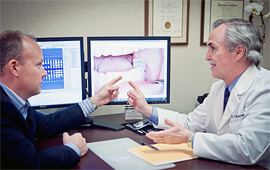 In these cases sedation dentistry is a way of accomplishing many years of backlogged dental work in one or two visits. 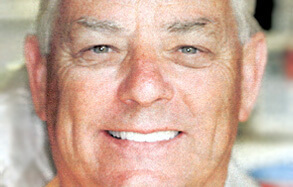 Sedation dentistry for San Diego residents has revolutionized dental work for many people. Dr. Briscoe enjoys helping his patients achieve dental health in a short time which hopefully prompts them to see him more regularly in the future. It works well for most patients, allowing them to relax and have little or no memory of their dental appointments (partial or total amnesia). It's easy! You take a pill one hour prior to your dental appointment. Some patients are so relaxed that they sleep right through their dental appointment. When someone is relaxed they will feel less tired after a long dental appointment, and there is less muscle and joint soreness. Because you are so relaxed and comfortable, a large amount of complex treatment can be accomplished in a single appointment. With more dentistry performed at each appointment, you have fewer dental appointments! People who have trouble getting numb are often helped by Oral Sedation Dentistry. If you are scared of needles, sedation dentistry can help you. People who have difficulty controlling movements, such as Parkinson's Disease or Cerebral Palsy are often helped by oral sedation. We find that patients who would normally gag during the procedures gag much less with sedation dentistry. Dr. Briscoe can complete more dental treatment of higher quality, in a shorter period of time, on a patient who is relaxed. Shouldn't you treat yourself to the luxury of sedation while having Dr. Briscoe and his qualified team provide you with fine cosmetic, implant, and restorative dental treatments? Dr. Briscoe's ability to put his patients at ease and provide them with an extremely comfortable and relaxing experience make it no wonder why they call him the top sedation dentist San Diego has to offer. We are here to provide that same level of comfort to you. "I delayed coming to a dentist for thirty years. I didn't want to come in until I chipped a tooth and ran out of oral pain relieving gel. At that point, I couldn't put it off any more. I had to find a dentist. "When I came in to Dr. Briscoe's office, I was very scared and nervous about what I was about to do. That was about 3 or 4 months ago, and I can't tell you how pleased I've been with the service of Dr. Briscoe and everyone in the office. "Being here has been a very nice experience — so nice that I am getting over another fear of mine: public speaking. How do you know if sedation dentistry is right for you? In a Consultation, Dr. Briscoe will explain how oral sedation dentistry works. The best way to find out about sedation dentistry is to schedule a consultation with top sedation dentist in San Diego, Dr. Briscoe. In a consultation, you can ask all of your questions, and find out exactly the best method for helping you through your dental treatment from one of the best cosmetic dentists San Diego has available, Dr. Charles Briscoe.